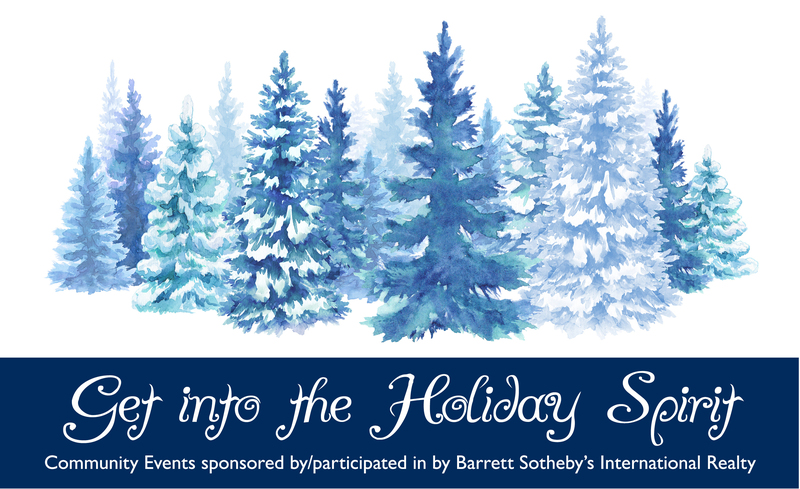 Barrett Sotheby's International Realty is proud to sponsor and participate in several holiday events. We hope to see you there! Seven of Concord's most beautiful private homes will be professionally decorated in the holiday spirit by local and Boston-based interior designers. Guests will be welcomed inside these gracious residences, each decorated in a different holiday theme. There will be live music, family friendly activities, treats, business give-aways and discounts. The tree lighting will take place on the common at 5pm. Our office, located at 49 Great Road, Bedford will be providing hot chocolate and free professional photos with Santa! This annual tradition is sure to delight with festivities including dozens of roadside attractions and a parade highlighted by Santa leading the tree lighting. Our office, located at 33 Walden Street, Concord will be providing cookies and a visit with Rudolph! Meet Santa and Mrs. Claus, enjoy hot chocolate, peruse the craft fair and gift basket raffle, explore local businesses and go on a scavenger hunt for the grand prize 40" TV. Our office, located at 525 Massachusetts Ave, Acton will be one of the stops for a clue along the hunt! We are also fortunate to be participating in opportunities to give back. Donations can be made at any Barrett Sotheby's International Realty Location. We're collecting new, unwrapped toys this holiday season. Please consider dropping off a gift for a child in need. Tickets purchased at our Concord office located at 33 Walden St, Concord. Three dolls will be raffled to benefit Louisa May Alcott's Orchard House. Suggested donations are 10/$10, 3/$5, and 1/$2.